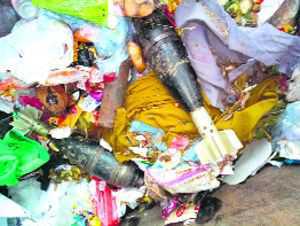 Panic gripped Ram Darbar after three live mortars were found lying in a heap of garbage in the area on Saturday morning. Garbage collectors noticed the mortars lying near the vegetable market, after which various police teams rushed to the spot. Cops cordoned off the area and the traffic on the adjoining roads, including Ram Darbar-Poultry Farm chowk road, was diverted. An earth mover was pressed into service to dig a pit to safely place the ammunition in it. The Army was also informed about the recovery of live mortars. An Army team later took the live mortars in its custody. A DDR has been lodged at the Sector 31 police station. The police have nabbed a Barnala-based priest and spiritual guru, Gulam Haider Ali Quadri, with 13 live cartridges at the Chandigarh International Airport here today. He was produced before a court, which sent him to 14-day judicial custody. He was sent to the Patiala jail. Giving details, Inspector Baljeet Singh, SHO of the Airport police station, said Gulam Haider Ali Quadri was heading for Kolkata. While passing through the departure scanning section, the CISF detected ammunition in his baggage and detained the priest. Later, the police were informed about it. On checking the baggage, the CISF and the police recovered 13 live cartridges of .32 bore revolver. Inspector Baljeet Singh said during preliminary interrogation, the priest claimed that he had a licensed revolver, which has been deposited with the police due to the poll code, and the cartridges were mistakenly left in his baggage. He said his weapon licence story had been verified and ascertained that he had deposited the weapon due to the model code of conduct. The Inspector said even though the priest had a licensed weapon, they had to arrest him as he did not possess documentary evidences to support the ammunition in the baggage. The police have booked Gulam Haider Ali Quadri under Section 25-54-50 of the Arms Act at the Airport police station, said the police.